Calculate INSTANT PRICE QUOTE on shipping Household Goods from the USA. ECONOMY Sea Freight Service. This web page is mostly written in purpose to help inexperienced, first-time international shippers to understand the difference between shipping from USA household goods and personal effects with U.S. Freight Forwarders versus hiring an International Moving Company. AMID Logistics is a licensed and bonded U.S. OTI - Ocean Transportation Intermediary (U.S. Freight Forwarder). Information in this article mainly relates to international sea freight shipping from the USA. Particularly to shipping from the USA an LCL freight (Less than Container Load). I.e., shipping from the USA boxes, crates, and pallets. You may continue reading about the difference or skip to most common issues related to LCL shipping that inexperienced, first-time international shippers should be aware of. If within your budget, you can afford convenience over the price, then you may search for a reliable international moving company on your international shipping from the USA. An international moving company's surveyor should visit you and estimate a cost of labor, cost of packing materials, freight cost, etc., to estimate the total shipping cost on your international moving from the USA. Some international moving companies offer "door to door" service. That means that they guarantee to dispatch your international shipment from the USA at the beginning to the very end. I.e., they promise that besides submitting your cargo to the shipping from the U.S., they will assist you in your cargo recovery in your destination country. They guarantee that they will work on your behalf with your destination country officials and seaport authorities, collect and pay on your behalf all cargo release charges and fees, deliver and unload your goods at the place you need. In this case, we'd recommend you to pay attention to the second part of your shipping from USA service agreement with the international moving company, which relates to procedures on your recovery cargo at the destination. However, the costs for using international moving companies on shipping household goods from the USA overseas are high. That is great if it is a business related international moving and your employer pays the price. Otherwise, you may need to consider an alternative. The alternative is to ship goods with international sea freight carriers. U.S. freight forwarders should assist you in this task. Running ahead, you can always hire a domestic moving company to properly pack and deliver your goods to an ocean freight carrier terminal. Such terminals professionally called CFS – Container Freight Stations. In this case, we'd suggest you ask your local moving companies if they are familiar with regulations and rules in international shipping from the USA. Particularly with ISPM15 regulations. It may be prudent to pay more but to be ensured that you will not get in troubles at the end of your international shipment due to improper packing of your goods. When you share a 40-foot sea freight container on shipping from the USA boxes, crates, and pallets with other exporters, YOU PAY ONLY FOR THE SPACE USED IN THE CONTAINER, but not for the entire container. Then it obviously more cost-effective compared to international shipping from the USA FCL freight (Full Container Load). Shipping from the USA LCL freight, typically, international SEA FREIGHT RATES ARE CALCULATING BY VOLUME BUT BY WEIGHT (per cubic meter/cubic foot). Since cargo vessels capacity is not in fact limited by weight of cargo but by hold of ship, then in general WEIGHT IN LCL FREIGHT IS NOT A PRICING FACTOR but the overall volume of shipping goods only (you may find more about dimensional weight in ocean freight and inland (LTL) trucking in the website). If you are shipping from the USA LCL, then YOU MAY SAVE ON INLAND TRUCKING. If you self-deliver your shipping boxed, crates or pallets, which can easily fit into your own or rented truck, to a sea freight terminal (CFS), then you will eliminate pre-carriage expenses that are pretty high in your total shipping cost. Pre-carriage expenses in international shipping freight from the USA may even exceed the actual ocean freight cost itself. Note: In shipping cargo from the USA using LCL freight, the term Ocean Freight means the price paid for cargo transfer (sailing) between international ocean freight carrier's terminals (called CFS - Container Freight Stations) in countries of origin and destinations. OCEAN FREIGHT IN INTERNATIONAL SHIPPING FROM THE USA DOES NOT INCLUDE COST OF PRE-CARRIAGE, ORIGIN AND OR DESTINATION CHARGES. See samples of total shipping costs calculations on Import or Export to or from the USA in this link. If you self-deliver your shipping from the USA boxes, crates or pallets to an international cargo transportation company's sea freight shipping terminal (CFS), then you may request to palletize your loose boxes into one or more shipping units at the shipping freight terminal. By palletizing your boxes, you make it safe for international shipping from the USA. IT IS MUCH EASIER TO HANDLE SMALL SHIPPING BOXES THAN HEAVY PALLETS. You may palletize smaller shipping boxes and request to ship more significant items lose. 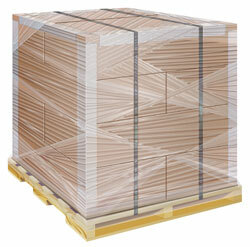 Then you can eliminate shipping cost and extra-volume charges related to the palletizing. (You may find more about palletizing on shipping cargo from the USA on our website). Note: International moving companies will box, crate and palletize your shipping from the USA goods. However, international moving companies will charge you for the labor, materials, etc. on top of actual international shipping cost. If you self-deliver your loose cardboard shipping boxes to an ocean freight carrier's terminal (CFS), then most of the time, the CFS will properly palletize and shrink wrap your shipping boxes for the shipping from the USA. The fee is approx. $35-50 per pallet. Use the opportunity. Do not palletize shipping boxes by yourself. Deliver light shipping boxes to CFS and leave the palletizing to professionals. Besides, that loose shipping boxes are much easy to handle, most important that YOU WILL TRANSFER RESPONSIBILITIES ON ISPM 15 COMPLIANCE TO THE SEA FREIGHT TERMINAL (CFS). Then you shipping boxes should not face any problems related to ISPM 15 during the shipping from the USA. By using LCL ocean freight service in international cargo transportation, YOU CAN SHIP BOXES, CRATES OR PALLETS OF ANY SIZES AND FORMS as long as it fits into a 40' ocean freight container. However, when shipping from the USA freight LCL, unlike with international moving company, there are specific rules and limitations that you have to keep in mind. Eventually, all these rules and limitations are quite logical. Follow your common sense and everything will appear in order. However, sometimes, inexperienced first-time shippers, consider sizable international cargo shipping from the U.S. overseas as mailing a postal card. Unfortunately, in the end, they will pay for the mistakes they made. Sometimes it can be a significant price. That's why, if this is your first-time international freight shipping from the USA overseas, we encourage you reading the rest of the article before you begin your international shipment. Below are to the most common customers' misunderstandings and mistakes in LCL cargo sipping from the USA that we are facing in our practice. All these topics already covered in our FAQ page. However, in this article, we try to concentrate on customers confusions and provide examples. IMPORTANT! : All these requirements, regulations and restrictions are standard in international cargo transportation by sea industry. No matter which company you are going to use in your international shipping from the USA. You have to be aware of at least basic procedures on shipping cargo from the USA overseas by sea. If you do not understand something, before you are involved in an international shipment from the USA, do not hesitate to contact us or double check with third parties. 1. It is shipper's responsibility to pack shipping goods properly. 2. If cargo pickup requested, then shipper has to be prepared to meet LTL driver and, if necessary, to provide help on loading cargo into the pickup truck. 3. If cargo is going to be self-delivered to a line haul freight terminal for the transfer to an ocean freight carrier's terminal (CFS) for the shipping from the USA, then shipper should be prepared to deal on palletizing with the line haul terminal. 4. It is shipper's responsibility to submit all necessary shipping documents. 5. Ocean freight (i.e., shipping from the USA by sea) does not guarantee transit time. 6. Responsibilities of ocean freight carriers and freight forwarders on shipping goods from the USA are to get cargo to a commerce zone of the destination country. ALL DESTINATION CHARGES RELATED TO THE CARGO RECOVERY ARE CONSIGNEE'S (RECIPIENT OF CARGO) RESPONSIBILITIES AND ON CONSIGNEE'S ACCOUNT. 7. The consignee is responsible for pickup released cargo at the destination freight terminal (CFS) or arrange "door delivery" with the CFS and pay to the CFS directly. 8. If shippers have no credit line with shipping companies, then they have to pay deposits. Actual shipping cost most likely will differ from the estimated shipping cost quoted. 9. Find more about LCL freight shipping from the USA with AMID Logistics, LLC. In order to use LCL service on shipping cargo from the USA overseas, all your shipping goods must be properly packed: boxed or crated and labeled. You may self-palletize your cargo, or you can request your sea freight carrier to properly palletize and shrink wrap your loose boxes at the sea freight carrier's terminal (CFS). Palletizing will cost you approximately $35-50 per pallet, depending on CFS. The charge will be added to sea freight carrier's invoice. Palletizing also may increase the chargeable volume of your cargo. However, this is the only way to ship from the USA a number of boxes safely. Reliable carriers may even not accept to ship from the USA more than 4-5 boxes being not palletized. Find more about palletizing. At a glance these packing requirements may look complicated, but not at all. Use common sense. Your palletized boxes will be handled by forklifts and professionally loaded and secured in a 40' multimodal sea freight container to be prepared for the shipping from the USA. You can use regular moving boxes. Using heavy duty boxes in shipping from the USA overseas are preferable but not absolutely necessary. People ask if they can ship from USA luggage cases, plastic bins, etc. Yes, you can. Just ensure that it is strong enough to keep the shape. Label every single item in case if your skid will be broken. AMID Logistics will provide you with a link to print your shipping labels. People ask, is it safe to ship from the USA some valuables by the sea in 40' containers? What should we say? Almost everything that you see in Walmart came by sea in the same containers. Add extra protection to your unique items. Bubbles wrap it. Vacuum it. Hire a professional packing company. Majority of ocean freight shipments from the USA arrive without damages and losses. If you consider extra protection, then ensure your cargo. If you pack in used boxes, erase all previous shipping labels and marks especially if it relates to dangerous goods or hazardous materials. If you are not confident that some of your goods are legal for the shipping from the USA, do not put your entire shipment at risk. Leave it. Do not ship or apply for legal assistance as in the U.S. as in your destination country. In our LCL sea freight service, when cargo pickups requested, we use U.S. LTL domestic carriers, but moving companies. LTL trucks are operating by single drivers. Then, on residential pickups, LTL driver may reject to handle bulky cargo since it is time and labor consuming. Therefore, at a time of pickup, you have to be prepared to help the driver with your cargo loading. Also, you may need to call to the trucking company that will be assigned on your pickup in advance to discuss and conduct your pickup conditions. If you ship too many of shipping units (packing and shipping from the USA an entire apartment or house, for example), then pick up option may not be available. You will need to self-self deliver your boxed and crated goods to a nearest to your freight terminal. Otherwise, you can hire a local moving company to transport your boxes on your behalf. On the one hand, LTL line haul freight terminals are not obligated to palletize cargo. On the other hand, they always palletize loose boxes to handle cargo by forklifts. According to our experience, typically, line haul freight terminals accept loose boxes and palletize it without questions asked. However, occasionally, they may request to palletize boxes to accept ones or charge a fee to palletize boxes. In order to avoid confusions at a time of cargo delivery, you may contact your linehaul terminal in advance to conduct the business. Note: Do not confuse palletizing boxes at line haul freight terminals with palletizing at ocean freight carriers' terminals (CFS). CFS should always properly prepare your goods for shipping from the USA. They should offer to palletize and shrink-wrap boxes for approximately $35-50 per pallet. CFS should also to re-palletize improper pallets to obey ISPM15 rules. Find more about palletizing. Note: Typically CFSs do not accept cash on palletizing. The fee will be added to the carrier's freight invoice. All ocean freight carriers follow the same rule: "No docs, no ship." That means that your cargo cannot be released to the international shipping from the USA unless all necessary export documents are in order and submitted to the ocean freight carrier. If cargo already at the origin Container Freight Station - CFS, but some documents are missing, it will stay on hold at the CFS till all necessary documentation be present or cargo taking back by the shipper. Free storage time is limited. Depends on CFS it varies from week to a few weeks. Then storage charges will begin accumulating. If a shipper decides to return his cargo, then in order to get a release on the return, he must pay in/out fee on top of storage. Do not delay your export documents. Prepare and submit it in advance or latest on the day after your cargo delivered and stored at CFS. IMPORTANT! Do not enclose or attach any shipping documents to your cargo. Do not write a list of the enclosure on shipping boxes. It may attract thieves. All documents must be sublimed electronically. Looks too complicated? Not at all. In general, most important that you will submit a commercial invoice that lists items you are shipping from the USA and the value in US$. Find more about commercial invoice in this link. People ask: I'm shipping household goods from the USA. How can I get a commercial invoice? The answer is: It is easy. If you ship household goods from the USA, then you describe your items and assign the value on it on your own. That's it. This document is called a Valued Packing List. AMID Logistics will provide you with a link to submit your Valued Packing List online. Find more about Valued Packing List in this link. Good news: When you're writing Valued Packing List on your household goods or personal effects you do not have to list every spoon and fork. Provide a general description like: used tableware, clothes, disassembled furniture, etc. Bad news: Avoid too uncertain descriptions in your Valued Packing List like '17 boxes with mixed household goods. Total value is $2,499'. It may be OK to get it released for shipping from the USA. However, destination county's Customs may ask you for a more detailed list. Depending on the destination country, ocean freight carrier may ask shippers for some additional documents, copies of photo IDs, tax info, etc. However, there should not be anything complicated to get and provide. Freight Forwarder should inform and guide you in the required documentation necessary to obtain a release for your goods to depart from the USA. When you use sea freight service on your cargo shipping from the USA, IT IS VERY IMPORTANT TO UNDERSTAND that as soon as your goods are entered into commerce zone of your destination country, all issues related to the import recovery, including providing all required by destination's Customs import documentation, is consignee's responsibilities (in respect of dealing with Customs professionally called 'Importer of records'). Neither freight forwarder nor ocean freight carrier will be able to assist you in it. However, with LCL Sea freight you are not alone. With LCL, your bill of lading always contains contact information of ocean freight carrier's destination agent. The agent should issue to your consignee an official arrival notice and guide you in the complexity of your import recovery. Read more about arrival notice in this link. Finally, always remember that it is you are shipping from the USA overseas but no one else. Freight forwarders and carriers are only assisting your needs. Then it is just shipper's and consignee's responsibility to submit all necessary shipping documents that will be required by sea freight carrier, origin and destination countries officials and third parties involved in your international shipment. If your shipment is time sensitive, then upon receipt a freight quote, you may ask for the nearest vessels schedule. Most of the time sea freight shipments depart and arrive as scheduled. However, delays may occur. Reasons for delays are not just weather conditions. Your multimodal LCL shipment's transit time depends on cargo and documents cutoff at CFS, trucking or rail traffic, hubs and seaports conjunctions and many more other factors. If you ship sea freight, then sometimes you may experience delays. We do our best to make procedures on freight shipping from the USA as easy, stressless and predictable as possible. We are proud of our business. Our customer satisfaction survey index is 97%. We continuously receive feedback from our clients. Many customers return and shipping from the USA with us again and again. You may see AMID Logistics' customer reviews in this link. Regrettably, sometimes we receive complaints. Most of the time, complaints that we face in our practice are complaints related to cargo recoveries at destinations. Almost all such complaints are from first-time, inexperienced exporters. Above is already explained about responsibilities on providing proper documentation on international sea freight shipping from the USA. However, providing adequate documentation is not the only issue in import recovery. IMPORTANT!! : Since you made your decision to ship goods from the U.S. overseas, you must clearly understand that as soon as your goods exit U.S. Commerce zone, U.S. laws do not apply on your freight. CARGO RECOVERY PROCEDURES AT DESTINATIONS AND ALL CHARGES ASSOCIATED WITH THE RECOVERY ARE CONSIGNEE'S RESPONSIBILITIES AND ON THE CONSIGNE'S ACCOUNT. Neither U.S. freight forwarder nor ocean freight carrier will be able to manage your import recovery overseas. Ocean freight carrier's destination agent should guide you in your import recovery. However, the agent is not a U.S. business. If you will face a problem with your cargo recovery at the destination, no one but your consignee (in respect of import recovery professionally called Importer of Records) can be aware of and work on issues that lead to the problem. Yes, International Maritime Laws should apply on your freight. But depending on the country that you ship to, the Laws may be interpreted in different ways. Do not say about other subjective factors peculiar to your destination country. Most of the time, with LCL freight, you do not need to hire a destination country's customs broker. Carrier's destination agent is the customs broker as well. However, we suggest that in case of problems, your first step is to apply for legal help from an independent customs broker in your destination country. Always request a legal Arrival Notice. Your Arrival Notice must be dated and contain the agent's letterhead and destination charges breakdown. Phone calls or random email are not enough. Deal properly with sea freight carrier's destination agent. Respect the agent's job. Their business is to get a release for your goods as quickly as possible. Follow the agent's instructions. Pay destination charges and fees (sometimes called Local Charges) and possess your released goods. If you face a problem in your shipping from the USA, do not hesitate to contact us. However, if you will not provide a copy of your legal Arrival Notice, most likely we will unable working with the carrier on your behalf. I.e., we will always need a copy of your Arrival Notice. REMEMBER: IMPORT RECOVERIES ARE TIME SENSITIVE! As quickly you begin working on it as less probably that you will face deadline penalties: storage, demurrage, Customs penalties, etc. Find more about destination (local) charges in this link. You may also need to to be aware of certain import requirements and limitations in your particular country listed in this link. Often people request us for 'door-to-door' service. With our LCL Sea freight, there is no 'door delivery' service included in the shipping cost quoted. At the origin, in the U.S., you can self-deliver your boxed or crated cargo to a freight terminal, OR we can arrange a pickup of your boxed or crated cargo from your door. However, your goods will be shipped to a bonded warehouse in your destination country (not to door). Bonded warehouse (CFS) means a freight terminal under the destination country's Customs supervision. I.e., if cargo did not get the CFS release, then it is still out of the commerce zone of your destination country. Cleared with destination country Customs and released by the CFS, your cargo must be self-picked up from the CFS by the consignee. Read more about destination (local) charges in this link. Sometimes people ask us about COD (Cash on Delivery) or Freight Collect service. They probably confuse international cargo transportation service with a sale of goods by mail order where payment is made on delivery rather than in advance. If the goods are not paid for, they are returned to the retailer. With all due respect, if you are a first-time shipper with us, we welcome you to use our service. However, you have to pre-pay at least 75% of the estimated shipping cost calculated based on weight/measurements (w/m) information provided by you in your quote and booking. Also, you will receive our final invoice, less the deposit already paid, not upon arrival of your cargo to the destination, but at a time when your cargo departed from the USA. I.e., we will invoice you at a time when your sea freight bill of lading (which is the title on your shipping goods) will be generated. Sometimes we may invoice you upon proof of your bill of lading. Find more about sea freight bill of lading. The invoice will be based on the actual weight/measurements of cargo you have shipped but on the estimated shipping cost calculated at a time of quoting and booking. The invoice may also reflect unaccounted cost from the carrier not included in the initial booking (if any), such as charges related to palletizing, fumigation, GRI occurred during the shipment, etc. In other words, you pay for what you actually have shipped, but not that you had estimated to be shipped. If you have overestimated your w/m, then you pay less. If you have underestimated your w/m, you pay more. That's why we request a 75% deposit, but 100%. Note that this billing practice is common in the industry. WE STRONGLY RECOMMEND READING Frequently Asked Questions (FAQ) on LCL Sea freight shipping from the USA in our website BEFORE STARTING SCHEDULING YOUR INTERNATIONAL SEA FREIGHT SHIPMENT. It should help you to understand the general procedures and price of your international shipping from the USA. The FAQ on international shipping FROM USA. EXPORT of LCL Sea freight. The FAQ on shipping TO USA. IMPORT OF LCL Sea freight. (Currently, AMID Logistics does not offer in import). LCL ocean freight (Less than Container Load): International shipping of boxes, crates, and pallets by sea. Consolidated sea freight. Note that you may use an LCL sea freight service for shipping from the USA both types of freight: either commercial cargo or shipping household goods from the USA. FCL COMMERCIAL CARGO (Full Container Load): Shipping from USA entire containers that contain a commercial cargo. The related sub-domain is in this link. IMPORTANT! : You must NOT use pricing schedule in this sub-domain on international shipping Household Goods from the USA! Shipping rates and procedures on shipping from USA containers with commercial cargo are different from international shipping household goods from USA containers with Household Goods and Personal effects. For shipping Household Goods from the USA use other sub-domains below. FCL on shipping HOUSEHOLD GOODS from the USA: International shipping from USA entire multimodal containers with Household Goods and/or Personal effects that are not for sale, but for personal use only. FCL containing MOTOR VEHICLES*: International shipping from the USA of entire multimodal sea freight containers loaded with motor vehicles. RO-RO international shipping: International shipping from the USA of cars, trucks, trailers, boats, heavy equipment, etc. * In respect of international shipping from the USA, motor vehicles mean vehicles such as cars, motorcycles, boats, jet ski, etc. that require registration with the Department of Motor Vehicles (DMV).